My 4 1/2 year old discovered our box of Halloween decorations and games this weekend, and even though I usually have a strict not-until-October-1 policy, he was having so much fun, I couldn’t stop him. 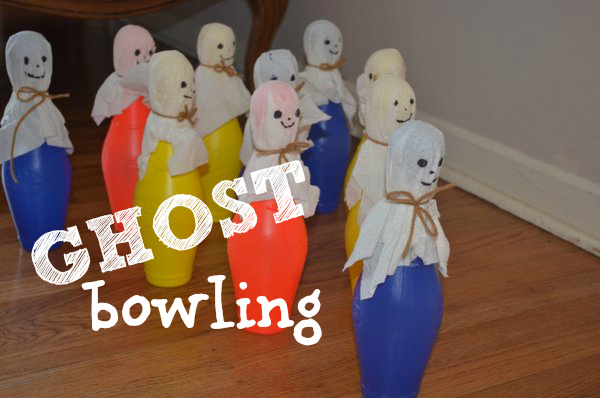 Ghost Bowling: One of his favorite Halloween games is Ghost Bowling. It’s very easy to set up- tie paper towels around bowling pins, and draw on a face with a marker. Then set up pins, knock them over, repeat, and repeat, and repeat…. To add a little learning, we had our 4 1/2 year old keep score. He counted the pins everyone knocked down, and then after each round announced who had knocked down the most pins in that round. 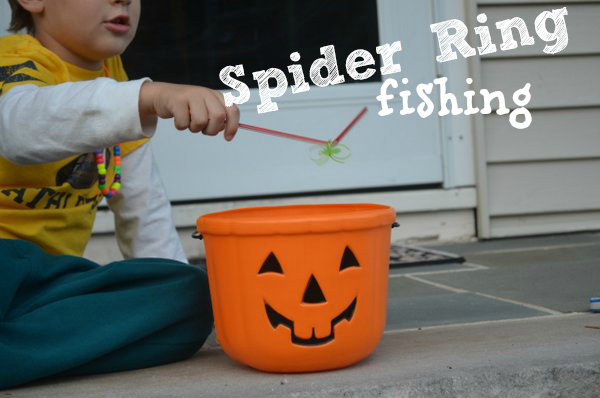 Spider Ring Fishing: I put a bunch of spider rings into a pumpkin container, and we fish them out with straws. This is fantastic for fine motor skills – and keeps kids happily entertained for a long time! Halloween Map: This is a new one my son developed today, and I love it! He spent a long time creating his map, using stamps, and markers. He had spooky areas marked on the map, as well as pumpkin patch in “Squigglehood” and an area where spiders live called “Riggly Jiggle.” He got out a toy sword, and then went around the yard, on his quest. I was able to reserve most of of our decorations for my official October 1 opening to Halloween. But that did not stop my son! He created his own decorations. They included a spider web, coloring gourds picked up at the farmer’s market, and making a spider statue, out of playdough, black thread, and a spider ring.